Many clients ask me for advice on what to wear for their mini sessions? I always recommend coordinating 3-4 colors. I Iove all of the colors that this family decided to go with for their session (see below)! They coordinated pink, blue (light blue & navy blue), white & gray and it went well against the yellow house, wooden steps and green background. Always keep in mind your location and then coordinate some of your favorite colors (that match the style or theme of the location), don’t forget to add in the accessories ;-) I love when Mama’s and daughter’s wear dresses too! Layering clothing also looks great! My logic is: you are getting professional photos done … do it up … get pretty, accessorize (earrings, bracelets, hair accessories for girls, hats, vests, jackets), do your hair and makeup … I will make sure we have fun and capture your best version of you and your family! Taking a great photo of your child is not an impossible feat for the everyday Mama! The latest iPhones are equipped with the technology to capture beautiful photos of our babies. I for one, love to use my iPhone 8 Plus as an everyday camera at home or when we’re out and about. With its portrait mode, shallow depth of field & editing options it’s possible for anyone to capture amazing photos of their kids! Many of my friends ask … how do you take such great photos of your kids on your phone? They chalk it up to the fact that I’m a photographer and while yes, I am a professional photographer, who is accustomed to manipulating DSLR cameras in manual mode, I’ll be the first to tell you that “anyone” can achieve awesome results with an iPhone camera! I will give you a step-by-step tutorial on how to take a beautiful image of your kid using your iPhone camera and then how to edit it using the phone’s editing options (no other apps needed) within minutes! Here’s an image I captured and edited yesterday, using my iPhone. I didn’t want to have to take out my professional equipment for a quick shot of my daughter! I will start with the finished product so you can see what you’re capable of creating if you follow these simple steps below! This is my 4-year-old daughter. 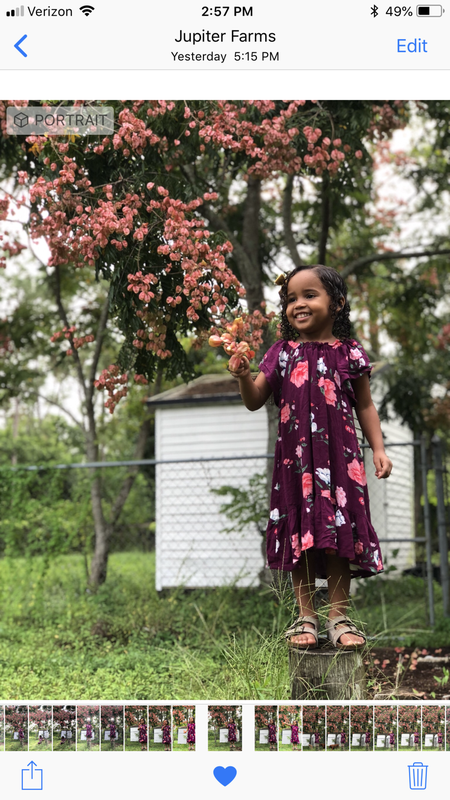 I simply wanted a cute photo of her in front of this pretty tree with pink blossoms that’s in our backyard. Most people think, I want to take a photo of my kid ~ so they whip out the phone and quickly click on the camera icon, snap really fast & then done, time to post it on Instagram. First, I took the type of snap shot that most Mama’s would capture of their child in this circumstance (see the image below). I mean, it’s cute right? The thing is, it will take a little more effort to get a better quality image! Are you ready to learn how? Continue on below. I would consider this a quick snap and done. Notice how it’s dark, there’s a lot of negative space, everything is sharp, you can see a pile of unwanted items on the left, the gate is crooked. I mean its decent, but it doesn't wow you in any way. Rather then take a photo in this hurried fashion, stop and think about what you are trying to achieve and then select the appropriate option within the camera mode. In this case, I knew I wanted a pretty photo of my daughter with the tree in the background but I wanted it to look a little bit more professional (without having to use my DSLR). 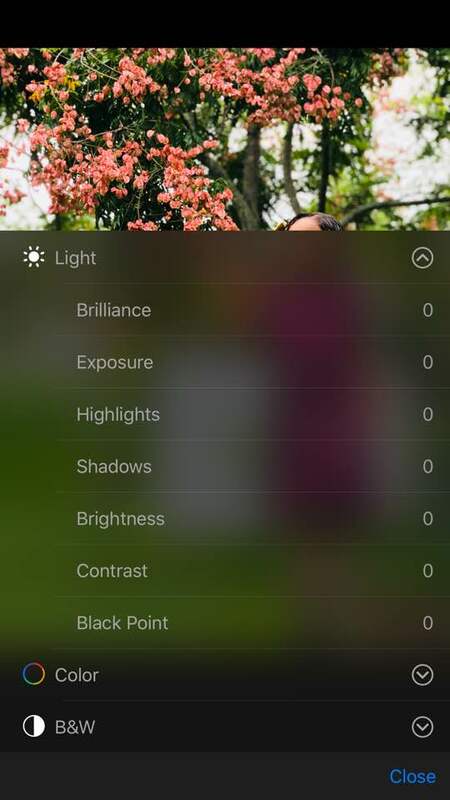 If you select the camera icon on your phone you will see a few options; such as, video, photo, portrait, etc. (see below). In order to accomplish a more professional look I selected the “portrait” option (see below) and got closer to the subject (my daughter) so that she was much larger in the frame. Straight out of the camera phone the photo was decent but rather dull looking and overall pretty dark because it was a bit cloudy outside. So i decided it needed a little bit of editing to really make it pop. If you look at the top right corner of the image you will notice a blue icon that says “Edit” ~ click on it. If you have selected the “Edit” option within your photo you will see a few icons at the bottom of your image. (see below) I selected the one that looks like three circles, then you will see different color options appear. I selected the “Vivid” option to bring out the color and contrast. The image looks more colorful but the horizon is still crooked so I selected the little “crop icon” at the bottom and straightened out the horizon by moving the line slightly to the right (image below). The photo is still dark so I decided to manipulate the lighting. I selected the “sun icon” on the bottom (image on the left). Then a drop down menu appeared (image on the right). The first option I selected was “Shadows.” Look at the bottom of the photo, you will see a bar that starts in the middle on a dot (you can move it to the left or right to add or reduce shadows). I moved it to the right to reduce the shadows, don’t go crazy here just move it to where it looks brighter but still natural. The last option I selected was “brightness.” I didn’t add too much here, just a slight amount to give it a more sunshiny feel. It probably took me 5 minutes to take this photo of my daughter. She’s four, so as you can imagine she didn’t quite cooperate perfectly, she actually fell off of the stump and was being goofy, then my dogs were photobombing her. I took over 40 images until I got a few I really loved. Add another 5 minutes (or less) for the editing. Once you’re familiar with where everything is on the camera app and how it all works, it’s actually really easy to get a great shot and you can do it quickly. It doesn’t take a professional to capture an everyday moment of your child using your phone! Living in South Florida, it is impossible to avoid unforeseen rain storms! And when photographing families is your job … it can be a huge bummer! Most of the time we avoid the drama all together by calling off & rescheduling the session; however, sometimes it’s just not possible. Why? Clients only in town for that one day, no job flexibility with people who work demanding careers that require weekends or the weather forecast flat out did not show any rain … ugh! In the case with this session, we happened to just arrive at our location and then the torrential rain started to pour on us. We sadly stood under a covered garage and watched it rain while trying to figure out what to do. We decided to stick it out and hope for the best because rescheduling wasn’t a possibility. First and foremost, give the client a chance to reschedule for optimal light and sun! Have patience! The odds are the storm will pass. Be creative! Is there a place for you to still photograph that is under cover? in our case we found a covered parking structure and started our session underneath it, while it rained around us. I was so happy that this client happened to have two adorable umbrellas that we were able to incorporate into the session. We didn’t stress it, we went with the flow, we captured some amazing shots under the parking structure & guess what? The rain stopped, and we were able to venture around the area. On my previous two blog posts I described how the petite newborn session is a great option for capturing your newborn session completely at home or all outdoors; however, today I am going to explain why the full session happens to be my favorite option! First of all, the full newborn session includes 3 hours of time (versus 90-minutes) and while this may seem like a tremendous amount of time to be taking photographs … I guarantee you, it isn’t! Many potential new clients might scratch their heads and wonder why soooo much time is needed for a newborn session. Check out this newborn session below. It was an amazing three hour lifestyle newborn session. We captured a variety of images in the nursery and Mom & Dad’s room, then jumped into our cars and headed to the beach which was only 10-minutes away. We were able to capture the family, the baby alone, the siblings, Mom with the baby, Dad with the baby and then do many of those same shots at the beach.